An adult human spine typically consists of 26 moveable segments: seven cervical vertebras, twelve thoracic vertebras, five lumbar vertebras, one sacrum, and one coccyx (tailbone). Intervertebral discs separate the segments from the second cervical vertebra down to the sacrum and a thinner disc is present between the sacrum and coccyx. 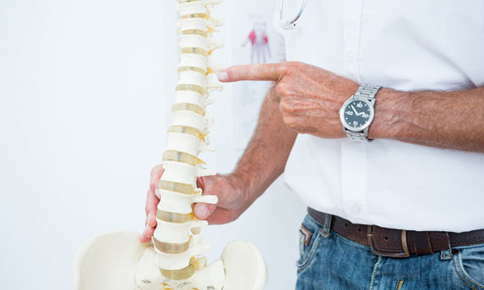 Intervertebral discs comprise about 25% of the height of an adult spine. Intervertebral joints connect vertebras and these joints are lined by lubricating synovial membranes. All of these structures are designed and built to last a lifetime. Intervertebral discs, which are gel-like colloids, begin to lose their water content at about age 2. This slow resorption is perfectly normal. Nothing lasts forever, and all living structures degrade and deteriorate over time. With this in mind, we can understand how it is that x-rays of older persons show various degrees of degeneration or arthritis of the spinal joints and intervertebral discs. These physiological changes are ominously or portentously referred to as "degenerative disc disease" by certain specialists, but it is important to remember that these structures deteriorate naturally. Degeneration or breakdown of spinal joints and intervertebral discs is not a disease, but rather a standard process that occurs over time, more rapidly in some persons than in others. There are measures we can employ to resist the effects of spinal degenerative changes and possibly even slow the process of degeneration itself. Spinal degenerative changes are problematic as they result in loss of resilience, flexibility, and mobility of the spine as a whole. The overall result is degradation of spinal function and increased possibility for strains, sprains, and other injuries. Solutions are available, as research studies have consistently demonstrated that regular vigorous exercise and healthy nutrition provide significant benefit in maintaining spinal structure and function. Regular vigorous exercise such as walking, running, bike riding, and strength training provide consistent weight bearing stress to spinal joints and intervertebral discs. Such mechanical stresses are required for these structures to retain their physiological integrity. For example, exercise pumps fluid back into intervertebral discs and increases lubrication of spinal joints. Healthy eating provides the nutrients required to support efficient repair and replacement of the cells and tissues of spinal structural components. Thus, by choosing to implement healthy lifestyles, we help keep our spines in peak physical condition and become better able to withstand the negative effects of natural physiological forces occurring over time. Having a healthy spine also depends on getting regular chiropractic care. Exercise, good nutrition, and sufficient rest are the primary requirements for spinal health, but there may be limitations and restrictions in the form of spinal joint dysfunction and nerve interference. These limitations prevent your spine from achieving optimal function and may lead to stiffness, loss of mobility, ongoing pain, and even injury. By detecting and correcting spinal joint dysfunction, regular chiropractic care helps eliminate sources of nerve interference and enables your spine to do its job, which includes handling heavy mechanical loads and moving you around during all your activities throughout the day. Regular chiropractic care partners with your other healthy lifestyle choices to help you achieve high levels of health and well-being now and into the future.